Temple University’s Military and Veteran Services Center (MVSC) was developed to not only be a safe space for the university’s military-connected students, but also a resource that positively impacts their entire higher education experience. For the third consecutive year, Temple has been named one of the country’s best colleges for veterans by U.S. News & World Report. The mission of the MVSC is to develop programs and streamline services to enhance the educational experience for military-connected individuals and their spouses, dependents and survivors. The Post 9/11 GI Bill provides benefits that can include up to 100 percent tuition and fee coverage, which can be passed on to spouses and dependents, and in some cases, also includes a housing allowance. “This center provides a central place where our veteran, active duty and dependents can socialize, come for support programs, find information, meet with employers and plan activities,” says Debbie Campbell, senior vice dean of the Temple University Fox School of Business and Management and Temple Veteran Association (TVA) faculty adviser. In 2009, Campbell set about convincing all of the deans in the university’s schools and colleges of the benefits of becoming a Yellow Ribbon institution, which provides extra benefits for Post 9/11 veterans. “Once the university signed on, we realized that we would be attracting larger numbers of veterans, so a Veteran Taskforce was formed in summer 2010,” says Campbell, who became co-chair of the task force. The taskforce continues to meet monthly – except in the summer – with representatives from all of the student support offices and college representatives who support military-connected students across all of Temple’s campuses and programs. The TVA is open to all veterans, active duty and dependents at Temple. Longtime Temple employee Laura S. Reddick worked in Temple’s undergraduate admissions office for two decades, where veterans were part of her portfolio. With the launch of a veterans’ affairs office in 2010, Reddick was tapped to run the program. 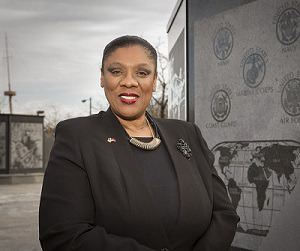 Her passion and commitment to serving veterans, her knowledge of the GI Bill and her desire to help military-connected students have made her thrive in the position, according to college officials. An important element for her right from the start was that participants on the task force should volunteer rather than be appointed, so they had a vested interest. “A lot of these folks are still on the task force,” Reddick says. “I met with the deans. I had the idea to have a veteran advisor in each of the schools and colleges because Temple has 12 schools and colleges and over 150 majors. That’s pretty overwhelming for a student to navigate. Reddick visited veteran centers in and around Philadelphia as well as the VA Hospital and the VA regional office. She and William Parshall, director of Temple’s Center City campus, also visited veteran centers at community colleges to see how they worked with military-connected students. “Develop partnerships and relationships with community colleges and the veteran organizations in the tri-state to have more of a holistic approach in helping veterans,” says Reddick. Transitioning from military life to civilian life while also pursuing higher education is a lot for students to undertake. Reddick realized it was not just necessary to understand the GI Bill, but to also have information about resources they can tap into to aid in their transition. Parshall asked Reddick to get all the key stakeholders on the same page, which she continues to do to this day. Through the task force, everybody learned what their roles are and gave Reddick perspective on how to build unity, create an effective workflow process and provide military-connected students with information about that process. Not all military-connected students have access to the Post 9/11 GI Bill. Some served prior and have exhausted their benefits, so Reddick has worked to create scholarships and financial packages, such as bringing in employers who have veterans’ initiatives. She also holds financial aid workshops, identifies veterans’ scholarships made available by corporations and makes students fully aware of FAFSA. There is an information-filled, user-friendly website, temple.edu/veterans. Reddick has made sure that clinicians experienced in treating post-traumatic stress disorder and military sexual trauma present vital information to the students. There is awareness training for the university’s counseling service, so they can refer students to agencies specifically trained to work with military trauma. MVSC found a permanent space on Temple’s main campus in August 2016. The opening was attended by former U.S. Secretary of State General Colin Powell and Admiral Thomas Lynch. Grants from Student Veterans of America and Home Depot paid for furniture and a tech grant bought laptops. There is space for employers to come in and meet with military-connected students about internships and job opportunities. “Membership and activities have grown tremendously now that there is a place to get information and to always be able to find someone when you need assistance,” says Campbell. MVSC stays abreast of federal and state legislation, such as a Pennsylvania ruling that mandated priority registration for military-connected students. That means the first day that undergraduate students can register for classes, which is usually reserved for seniors, is now open to military-connected students as well. “We have a lot of employees and faculty who served in the military, a number of them in the Vietnam era. They remember their own experiences where their college campuses were not a safe place. They understand the importance of doing this,” says Parshall. There are reinforcements and validations like salutes to veterans at football games. Military Appreciation Month is held in November, which hosts a series of events. A huge development has been serving female veterans, who Reddick says were “invisible” until she started seeking them out. MVSC holds an annual Women Veterans Forum each April. Female veterans and military members can address the challenges and issues they face in transitioning to civilian life. One year, there was a pop-up closet where the participants could get free clothes. Organizations throughout the tri-state such as veterans’ centers from different counties in the area that provide direct services are invited. “I invite women veterans who have a Temple connection, either alumnae or a faculty or staff person, to participate in panel discussions or be a keynote speaker,” says Reddick. “It’s a day we honor them. We’re not just talking about the challenges they face, but we’re also recognizing women who have served. Their stories are amazing.